Alexander Shulan of the Brooklyn Rail reviews EFA Project Space artist Matthew Day Jackson's solo exhibition, "Something Ancient, Something New, Something Stolen, Something Blue," on view at Hauser & Wirth from September 6th- October19th, 2013. 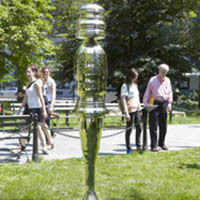 In an ongoing project, Common Ground, organized by Public Art Fund, EFA Project Space artist Matthew Day Jackson presents an unconventional self-portrait in stainless steel. The exhibition is up until November 30, 2012.